such lovely things: Run for your life! Running....hmmm, that really belongs to my life before children. To be honest, even then it was fairly short lived (keep reading for more on that)....And yet, as is my wont every June, I don my trusty Nike trainers and go for a run. 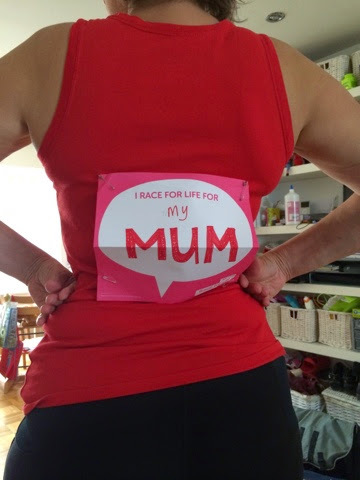 Not just any old run, you'll understand, this is my once a year participation in the Race for Life. It's a 5km run for women organised by Cancer Research UK and there are around 200 of them up and down the country every weekend in the summer months. I ran my first Race for Life in 2007 in memory of my friend Lyn. She lost her battle with cancer almost exactly a year earlier. I wore a red shirt (her favourite colour) and tried to remember the fun we used to have together as I ran with 5000 other women, each with their own stories. I was cheered on by my mum and then 1year old daughter, Charlotte. Fast forward to the following year and I ran with 3 wonderful friends in memory of my mum. We had no idea at that Race in 2007 that mum had a massive tumour on her kidney & wouldn't survive much after diagnosis. Needless to say I cried most of the way round. Why did I run? Well, I had a crazy idea one Christmas that I'd like to run a marathon before the next Christmas. My husband's response to that was simply : "D'you think you ought to go out for a run first, to see if you like it?" !!! I went for my first run the day after Boxing Day with a smattering of snow on the ground and, it's quite fair to say, I really didn't like it!! But my mind was made up, I bought a book, devoured it & made a plan. I was aiming for the New York Marathon. The timing was perfect - it takes place at the beginning of November so would give me plenty of time to train and yet could still be done before Christmas! Those of you who know me well know that I'm an 'all or nothing' kind of girl. This is an extreme case in point!! I started walking (I've always walked at quite a pace, so speed walking wasn't a problem). Then I started alternating walking and running. Run to the next lamppost, walk to the next, etc. Gradually I could run past two lampposts, then three. Perhaps this running lark was possible after all! Over the next 10months I went from running nowhere to running AT LEAST a half marathon every weekend!! And on 2nd November 2002, I ran the New York City Marathon in 4h06m. I'd arranged to meet my husband by a certain tree in Central Park at the end of the race (he ran on ahead since he was much fitter & faster than me). He was genuinely surprised to see me there so quickly!! And now? Now I hardly ever run. Hmm, in reality, I run once a year! 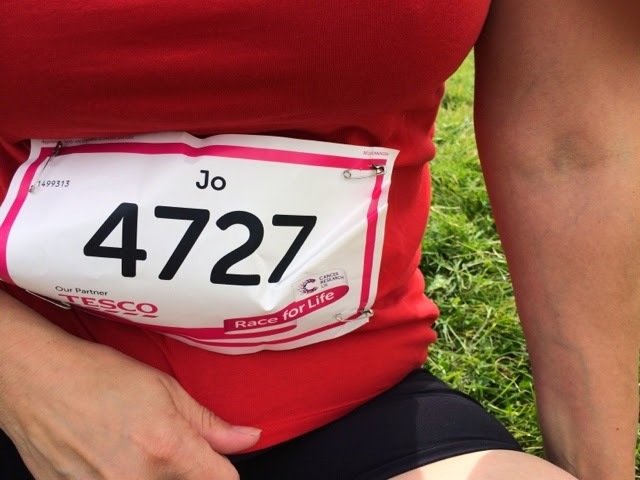 The Race for Life is an important part of my year and I will do all I can to be part of it, by running and asking for sponsorship to raise money for Cancer Research. I still run in memory of my mum, but I also run for all those fighting this horrible disease. There are too many of you for my liking. And this is my small way to help.